Sausage casserole with potatoes and carrots. CLASSIC KITCHEN. Sausage Casserole Cumberland sausage, cooked in a rich red onion gravy with chunky carrots. 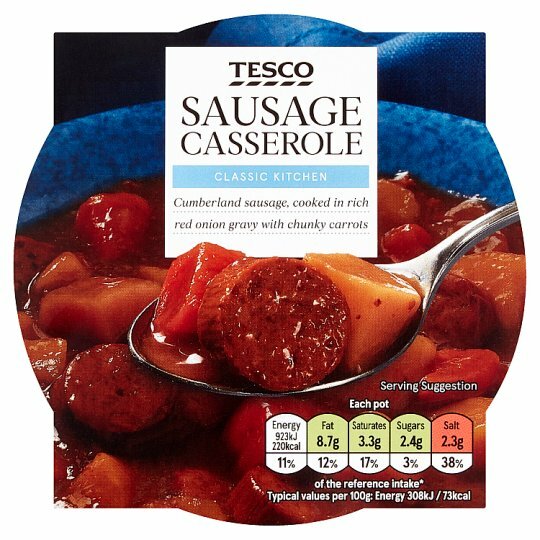 INGREDIENTS: Vegetables (39%) (Potato, Carrot, Onion), Water, Cumberland Sausage (15%), Modified Maize Starch, Maize Starch, Wheat Flour (Wheat Flour, Calcium Carbonate, Iron, Niacin, Thiamin), Beef Bouillon (Salt, Yeast Extract, Flavouring, Wheat Starch, Beef Extract, Palm Oil, Onion Powder, Celery Seed), Brown Sugar, Caramelised Sugar Syrup, Onion Extract, Black Pepper.